Home / QuartetsBecome A Member! Are you looking to start a quartet? Instant Classic at the 2015 Pittsburgh International Convention. For logistical step by step instructions with getting a quartet set up with The Society, we have a host of informative links and documents in the Quartet menu you can browse through in this section to help you along. But if you’re asking philosophically, What type of quartet do I want to start?, then there are many directions in which you can go. Quartetting is, put simply… fun. Read on below to learn more about the types of songs you can sing, the types of quartet you can be, and the different genres that are available in the barbershop style from our vast library of sheet music and resources. What types of songs can you sing? Rhythmic, peppy, driving, fast… uptempo uptunes are a fantastic way to light up a stage with harmonic fireworks and demonstrate vocal agility. Ringmasters is a Society quartet based out of Stockholm, Sweden known for their astounding musical and vocal abilities. This performance of Notre Dame brought the house down at the Society’s 2016 International Convention in Nashville. After Hours is another extremely talented quartet that demostrates mastery of the barbershop style. Listen to this barbershop rendition of Butter Outta Cream, a song from the production Catch Me If You Can. The Barbershop style is perfectly suited to deliver a heartfelt ballad in a way so few other art forms can. The purity of four voices coming together creates a sound that is at once powerful and yet vulnerable in a way only the human vocal instrument can achieve with its infinitely variable colors and emotions. Main Street won the Society’s 2017 International Quartet Championship in Las Vegas by singing six songs, one of which was this rendition of Smile, A song written by Charlie Chaplin. Take note of the commanding performance by lead singer Tony De Rosa as the rest of the quartet masterfully supports everything he does musically and emotionally, all of it coming together in a breathtaking emotional journey. 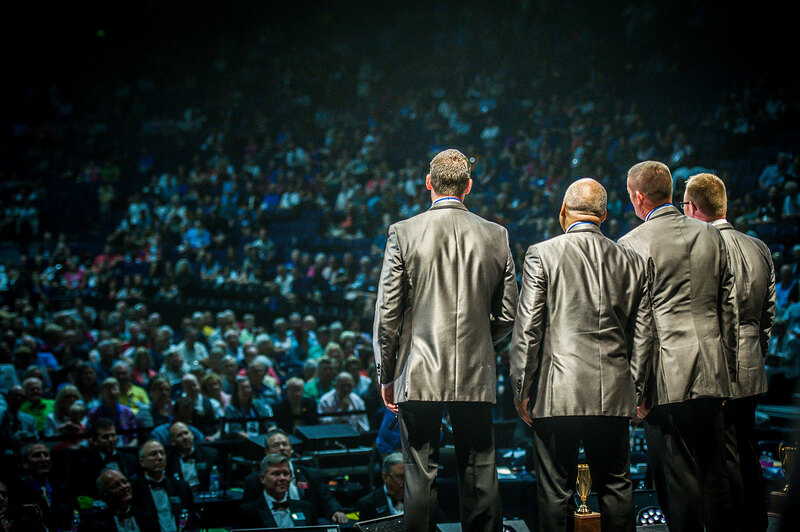 The Society’s 2009 International Champion Crossroads is a quartet that has broken down barriers and brought Barbershop to new audiences through national television appearances, countless performances all over the world, and national recognition by leading music education associations. They demonstrate just a small sample of their musical excellence with this stirring performance of That Lucky Old Sun, a 1949 song made famous by performers like Frankie Laine and Louis Armstrong. You can try your hand at comedy. Barbershop has been, and perhaps forever may be associated in the minds of many people with niche comedy and entertainment, a throwback to a bygone era of Tin Pan Alley and Vaudeville complete with boater hats, mustaches, and suspenders. And that’s ok. Even as modern Barbershop proves itself as an advanced musical art form capable of expressing the broadest range of human emotions, there’s undoubtedly a vast comedic realm to explore through the vehicle of Barbershop harmony. Not only is Main Street one of the Society’s most artistic and virtuosic quartets, but they demonstrate an absolutely brilliant comedic timing in this performance of their Pop Songs Medley where they mix “good old fashioned Barbershop harmony” with some of the modern pop songs of the modern era. The results are both hilarious and disturbingly wonderful. In 2011, Lunch Break found a video on YouTube of an irish comedian they liked and adapted the bit for themselves for a performance that truly borders on the realm of the absurd. Using the classic and ubiquitous children’s song “Old MacDonald’s Farm” as a vehicle, their list of animals quickly takes an unexpected turn. Are you 25 years old or younger? 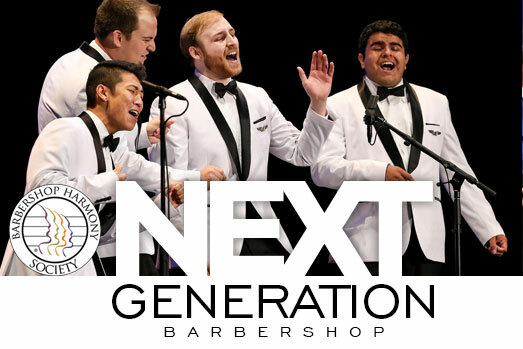 With Next Generation Barbershop, there are now many ways that quartets with members 25 and younger and 18 and younger can get involved at regional and international conventions. Next Generation Barbershop Contests and Festivals offer easy video entry and exciting destination events. ‘Varsity’ quartets (all members 25 or younger) and ‘Junior’ quartets (all members 18 or younger) have an opportunity to earn the chance to perform for literally an audience of thousands of enthusiastic fans in an environment that’s electric and create unforgettable memories that will last a lifetime. Are you a senior looking for a chance to perform at Midwinter? Similarly to the YBQC, the Seniors Quartet Contest holds regional based contests where Seniors Quartets (each member at least 55 years old with an average age of 60 for all quartet members) vie for the chance to qualify to compete at the International Seniors Quartet Contest at the annual Midwinter Convention. Contemporary, Doo Wop, country, jazz, gospel, broadway show tunes, children’s songs, even classical… if you can think of a genre, there’s most certainly a barbershop arrangement available for it. Powered by the human voice, Barbershop harmony truly makes anything possible. Signature is a Society quartet that hails from Florida. Formed in October of 2013, Signature is composed of four powerhouse voices. All four members of the quartet have been barbershoppers since their early teen years and have been in many different quartets… but at the first get-together, these guys knew that they had something special. This rendition of Luther Vandross’ Dance With My Father left the audience (and lead singer Daniel Cochran) in tears, showing the true potential of a barbershop song to conjure a powerful emotional response. Don’t let Lemon Squeezy‘s zany name fool you. These gentlemen from Sweden are all business as they bring the song Pass Me The Jazz made popular by another a cappella ensemble The Real Group into the Barbershop style with effortless style. From Stockholm to the Society’s 2015 International Convention in Pittsburgh… with love. With this performance of Two of a Kind, Working’ on a Full House made famous by Garth Brooks, Throwback shows us how easily country music ports over into the Barbershop style. There are many, many famous country songs available in the Barbershop style, and Throwback proves with this song that they can be just as driving and exciting as the originals when four voices are in perfect lockstep. This breathtakingly complex and virtuosic performance by legendary Hall of Fame quartet The Gas House Gang proves that with Barbershop, there truly is no genre that cannot be ‘Barbershopped’. Listen to this rendition of Mozart’s Eine Kleine Nachtmusik as they sing every note with added lyrics that tell the story of the classic opera The Magic Flute, and try to follow along if you can. Community Singouts… Nursing Homes… Malls… Barbershop is absolutely everywhere.